Electric bikes are becoming more and more popular. This type of bike is great fun to ride, and genuinely really useful too. If you love the idea of cycling but aren’t keen on hills, want a practical commuting alternative (electric bikes are an awful lot cheaper than running a car), or would just like a little extra oomph as you build up your fitness, an electric bike could be just the thing for you. We have put together a handy guide to choosing your perfect electric bike. Let’s start with the basics. 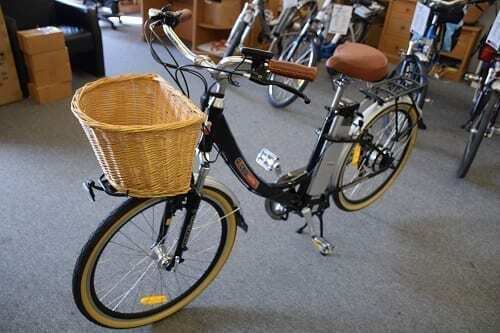 Put simply, an electric bike, or e-bike as they are sometimes known, is like a traditional bike, but with an electric motor and accompanying battery added on. You do still have to pedal but the motor will kick in when needed to give you a boost. Generally speaking, electric bikes have a variety of different settings so you can select how much extra input you want from the motor, depending on the terrain and incline on your ride. Usually, the same regulations that apply to normal bikes also apply to e-bikes. There are a few additional regulations that you need to be aware of too: the motor’s maximum output can’t be above 250 watts and to ride them on a public road you must be at least 14 years old. Make sure you have the suitable safety kit too, you don’t need anything extra for an electric bike but you should make sure you have suitable equipment, such as a helmet and lights. Before you invest in an electric bike, think about how you are planning to use it. Is it primarily for leisure, commuting or working on fitness? All of these will make a difference to the bike you finally choose. With their motors running, an electric bike will happily go along at around 15 mph – easily enough to keep up with rush hour traffic in busy areas! Obviously, when you add in your own pedal power, it will go faster. Their main advantage in rush hour traffic is acceleration, which is great for stop-start cycling. For leisure cycling, a main attraction is a little extra help up those hills, which can make cycling for enjoyment a lot more fun – as will a comfortable saddle! An electric bike is also an excellent way to build up your fitness levels if you are looking to find your way back into exercise – as well as helping with the hills, you have the extra boost waiting for you when you need it. There are two numbers that are important when you are looking at the performance of an e-bike. The first is the battery capacity, which will tell you how much energy the battery can hold. Put simply, the higher the number, the further you can go! The second is the voltage, which refers to how powerful the motor is. This is limited in the UK, so there won’t be a great deal of difference, but more power means more speed. Of course, more power also means more drain on the battery, so you will run it down faster too. Most electric bikes will come with a variety of modes for you to choose from, so consider what you think you will use the electric aspect for and choose one with the right options – getting up to speed in the commute, or a boost from time to time so you can enjoy cycling for longer. Being able to select different settings means that your battery should last longer too. As with traditional bikes, there are a range of options on electric bikes to help you with choosing the right model. If you are buying it to help with your commute, you might want to look at folding models to help with storage; this is also useful if you don’t have a lot of space at home – they can be, as the name suggests, simply folded in half, which takes up a lot less space. For leisure cycling take a look at the suspension options – the last thing you want is a bumpy ride!